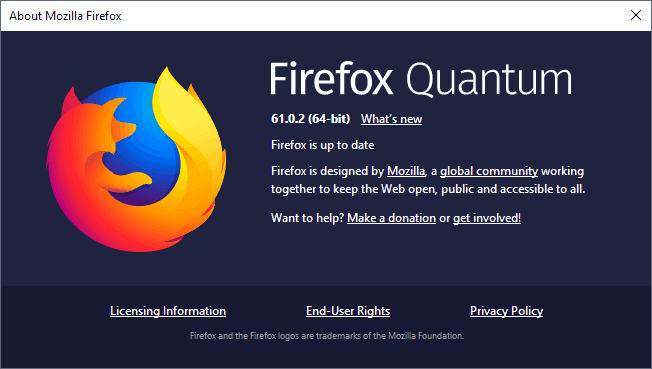 Mozilla released a new version of the organization's Firefox web browser to the release channel on August 8, 2018. Firefox users who run the a release channel version of the web browser can use the browser's automatic update functionality to download and install the new version. Set it to false to disable the feature so that Windows won't start Firefox automatically on start if you did not terminate the program at the end of the last session. Is this why Firefox 62 beta for the first not placebo at all, starts almost instantly, like MS Edge? Preloads shite? I don’t know. The feature added to the release channel works only if you don’t close Firefox before you shut down or restart. For most users yes, but it will be enabled as far as I understood it for more users over the next weeks. I don’t like the idea. I clearly want everything purged from RAM if I’m restarting my computer. You can make sure it is turned off using the instructions. Won’t kick in then. Yeah, it’s disabled here right now. I’ll keep an eye on that setting in the upcoming updates to make sure it stays this way. toolkit.winRegisterApplicationRestart is indeed false by default now here on Firefox 61.0.2, now and forever since I’ll enforce it to false in my profile’s user.js. But I can understand the feature may be appealing hence pertinent. I’m currently using 62b15 on “Windows 7” and “toolkit.winRegisterApplicationRestart” is set to true. It’s also set to true in Nightly. I generally do not leave any applications running if I shut down or restart Windows so I’m going to leave the setting set to true, for now. And I use a UPC so power outages aren’t a problem. Until something comes along that is comparable to the Tab Mix Plus session restore I’m okay with “ApplicationRestart” being enabled but then I can’t imagine in my case that it will ever be used. We’ll see. Depending on the new features coming up I will often temporarily update to the beta channel to see how things are working. So far 62 Beta is working very well. UPC should have been UPS (Uninterruptible power supply) — What a maroon! Today, this cowboy is failing miserably at multi-tasking. The default for “toolkit.winRegisterApplicationRestart” is true in both Beta and Nightly, on Windows 7. I didn’t make that clear. If restoring sessions happens automatically, then I am opposed to it. If it’s in the form of a prompt asking if I want prior sessions restored, then I don’t have a problem with it. Thank You Sir/Ma’am/Miss/Ms/Mx/My Lord/My Lady. LoL. Finally, someone that actually gets my lame attempts at humour! “double entendre” would be “à deux sens” : “Le mot maroon est à double sens” (“The word maroon has a double meaning” … “c’est un jeu de mots” (“it’s a word game” [or “pun” tells me Deep Translator]). I’m sorry Tom, I could do a much better job remembering that gHacks has a surprising amount of global visitors. It’s actually pretty impressive and I love it, the diversity. I need to remember that my American cowboy slang and humour does Not often translate very well to those outside this country and for that I apologize! Bugs Bunny, Elmer Fudd, Daffy Duck, Wile E. Coyote, Charlie Brown and many many others are animated cartoon characters from The Glory Days of hand-drawn animations. They all drastically went down in quality as artists got too expensive and computers replaced them. I think the early days were pretty incredible and funny as hell! And I’m personally very sad for everyone not familiar with those characters. @Richard Allen, diversity! pluralism! that is the salt of life! I agree beyond my mind, from my very soul, I love it as well. This approach makes terms like “tolerance” insignificant because I am not to tolerate differences but to worship them given they are the source of humanism and at the same time of self-improvement. You’ve lived diversity far more than myself. Europe is my nest and America a six years’ fly away (1959-1965). Twelve years in Switzerland where I was born, two years or so in the Netherlands, touch ‘n’ goes in Germany, UK, Italy. As a child, previously to NY, I traveled with my parents in several countries where the U.S. had Army& Air Force bases (dad worked for the DoD as a civilian). I remember nevertheless Tripoli in Libya, Ramey AFB in Puerto Rico, the PX stores … “flashes” more than precise souvenirs … but all participating by their diversity to enrichment of my thoughts and construction of my mind. Diversity means identities, and respecting ours as those of others is a condition of valuable dialogs, the problem is never in diversity but arises when one considers his identity as superior, only. I appreciate that culture you share, I learn. Part of that culture you describe was mine even if six years as a kid in The States some fifty years ago is far less nourished by American culture than yours. I read your comments about Colorado, cow-boys & horses, the duality between your interest (love) for that life though tempered by your lives abroad (we never commit ourselves the same way when we have multiple experiences of the world). Texas is one State and one part of America many people know only by cliches. I visited my dad (last time I saw him as well) when he had retired in El Paso, in 1982. But I know nothing of Texas and so little of the USA to which I relate only via my memories of N.Y. fifty years ago, even if such an experience created a basis to better understand what I discovered and continue to discover of America through the ages. In N.Y. I attended moreover the United Nations International School (UNIS) with friends from all horizons be they ethnic, cultural, religious and citizenship : impossible with such a background to be “blocked” in the face of differences, those differences which have all contributed to what I am now. I truly believe this would be a better world if more people were able to travel and meet new people from different cultures and took the time to have a real conversation with those that have different ideas and values. I’m not talking about tolerance but about knowledge. There is more knowledge available today than ever before in history. But few would argue that people are wiser than ever before. Anymore, tolerance is a synonym for shut up and just accept what you don’t like and only applies to those with opposing ideas/values. @Richard Allen (August 11, 2018 at 6:50 pm), hard to say maybe what makes us fond of a place, several things perhaps, some objective and some subjective; and what makes us recall those places in good or bad terms. Social and relational life, environment, way of life. But memories sometimes don’t correspond to the way we loved or disliked places back then. I think time is a parameter among others in our own analysis of what we cherish or not. The present moment is always parasitized by ourselves. Without memory there is no intelligence, the past is always present in our approach of things when the future is not, which is why the real, the most essential and mysterious aspect of life is the future. @Richard Allen: And I’m personally very sad for every Frenchman not familiar with Pepé le Pew. In the French dub, he’s Pépé le Putois (Pépé the Skunk), he’s Italian, and he’s just not as funny — the voice talent and dialog just don’t rise to the level of the original. Also, you’re from Texas and *Bugs Bunny* is your hero? Not Foghorn Leghorn? I say, I say, I say, what’s *wrong* with you, son? – I don’t like the idea of an automatic restore, mainly because if it works like the current tab restore with “Save and Quit,” many times it restored the wrong web pages. Also there is the risk of resubmitting info at certain sites. – Did anybody notice the need for a restart upon updating using the offline installer? I wonder why. This never happened to me before. I am using beta version and Developer-Edition version. With this TOPIC, I learned that the automatic restoration function was activated. The automatic restoration function is convenient, but I think that “risk” will also be invited. Unexpected reboot or shutdown of the OS is rarely happening. Temporarily preservation will be done in a timely manner, and you will be in a measure by doing Backup. If it still occurred, I will give up “I was in bad luck”. For me, the automatic restoration function is not important. However, in the current end user situation (skill is unnecessary and emphasis on usability), I understand that it is a welcome function (automatic restoration). Mozilla provides services to unspecified majority (from children to the elderly, men and women). The viewpoint (product development) of “beginner user and entry user” which account for the majority of the end user layer is important. If this perspective is inadequate, Mozilla will not be able to survive in the industry because it will be abandoned from the main customer base. Therefore, adding this automatic restoration function is reasonable. The automatic restore function seems reasonable for Windows 10, where (as I understand it), unplanned shutdowns and restarts are more frequent than in previous versions of Windows. Fortunately, I have never experienced an unexpected Shutdown or Restart. OS update is only “automatic update”. Set the active time. I am interested in Issues. Might wanna throw in 3 or 4 more AV software in there, doesn’t feel safe. Depends of the AV, some are not sure at all. The option to set cache size used to be in preferences have tried to rest to 75mb in config file but it reverts back to default. If you’ve modified manually settings in about:config but they revert when you restart Firefox then check in your Firefox profile for a user.js file which may contain the same settings you had modified manually. Can you still disable disk cache? Can you alter the same of memory cache?